but you'll have more to share and these macaroons taste a heck of a lot better. Place the first three ingredients in a large, heavy saucepan, and stir to combine well. Cook over medium-low heat, stirring regularly, about 10-12 minutes, until the mixture is pasty but not dry. (The uncooked mixture will look sort of granular at first, then creamy as it heats, and then it will slowly get drier and drier. You want to stop cooking when it no longer looks creamy but is still quite gluey and sticky, not dry.) Remove from heat. Mix in vanilla and almond extracts. Spread out the coconut mixture on a large baking sheet. Refrigerate until cold, about 30 minutes. Preheat oven to 300 degrees Fahrenheit. Line another baking sheet with parchment paper or a Silpat baking mat. Using a ¼-cup measuring scoop, scoop and pack the coconut mixture into domes, and place them on the baking sheet. You should wind up with about a dozen. 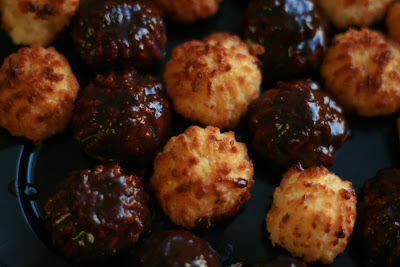 Bake the macaroons until golden, about 30 minutes. Transfer to a rack and cool. Set cookies on rack over a rimmed baking sheet. Place the chopped chocolate in a medium bowl. Heat the heavy cream in a small saucepan until it is very hot and steamy (not boiling), remove from the heat, and pour it over the chocolate. Whisk until the mixture is smooth and the chocolate is thoroughly melted. 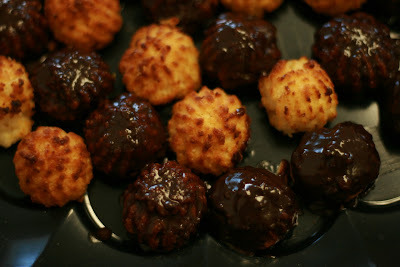 Spoon the glaze over the macaroons, covering them almost completely and allowing the chocolate to drip down the sides. [You will have leftover glaze, which can be refrigerated or frozen.] Refrigerate the macaroons until the glaze sets, at least 2 hours. Transfer the macaroons to an airtight container, and refrigerate or freeze. *flfarmgirl note: The chocolate glaze would be delicious on a number of fruits, try pears or strawberries. If you are pressed for time, you could even buy the plain macaroons from your bakery and add the glaze. hello, i read your profile and it is interesting to know what EBS means..that's what happens too when im done cooking..
Ohhhh, those sound yummy. Just came across your blog. I have relatives who are in what I think is central Fla. Zolfo Springs. These look absolutely delicious.. Just stopping by through foodie blogroll. Nice to meet you. Looks like you have a fantastic blog! Beautiful! Can't wait to try it myself.